See the Shortwave Radio Kit below! Here are plans for building a shortwave radio receiver using 3 transistors, a simple homemade coil, an Air Variable Capacitor and some common electrical parts. This circuit is from Charles Kitchin, who has provided a multitude of great radio plans to the hobbyist community. A unique feature of this simple circuit is the ability to control the regenerative feedback at the first transistor amplifer stage for high gain. Here we present the circuit diagram with discussion, and describe our compact printed circuit board version of the radio. 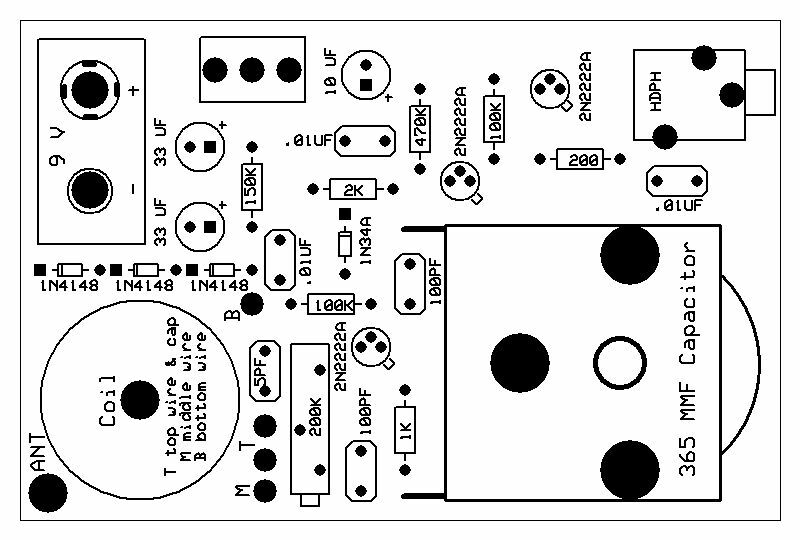 We also are now offering a parts kit to build the radio, see below. The resonant RF front end is tuned using the variable capacitor and small air wound coil. The coil is wound on a 1 inch diameter coil form with 12 turns. The coil is tapped 4 turns from the bottom to provide a regenerative feedback signal. The first transistor comprises the RF amplification stage, and signal regeneration is controlled by adjusting the variable potentiometer. (The trick in using the regeneration is to adjust the gain just short of causing feedback oscillation.) The signal from the RF front end is detected by a 1N34A germanium diode, and amplified by a two stage audio amplifier with the two additional transistors. Here is a view of the compact layout of the printed circuit board. Several convenient features were added in the board layout. The 9V transistor battery is mounted upright using a snap type battery connector, which is soldered directly to the board. The air variable capacitor is also mounted directly to the board. Headphones are easily used with the radio because of the convenient plug type connector. This radio has surprisingly good performance considering it's simplicity. We have found that even a short length of wire strung indoors makes a satisfactory antenna. Many stations were easily tuned inside an apartment building. The nominal tuning range is 5-15 MHz. The tuning range can adusted lower by adding more coil turns, or removing turns for tuning higher. A more substantial outdoor antenna can provide improved DX reception. A few comments about using the radio: In today's digital tuning world we've found it great fun to use this radio's analog tuning to quickly sweep the shortwave band with the simple turn of a knob. Also, adjusting the tuning and thereafter tweaking the regenerative feedback for maximum signal requires some skill and practice, which makes our shortwave listening all the more enjoyable. Shortwave Radio Kit from MTM Scientific, Inc. 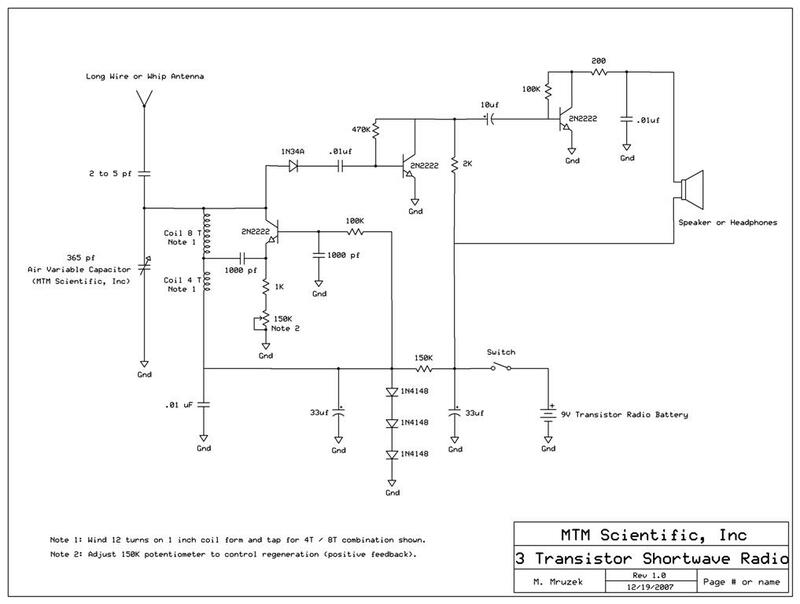 The SHORTWAVE RADIO KIT (#SWRAD) from MTM Scientific is a complete parts kit for building the shortwave radio described and shown here. 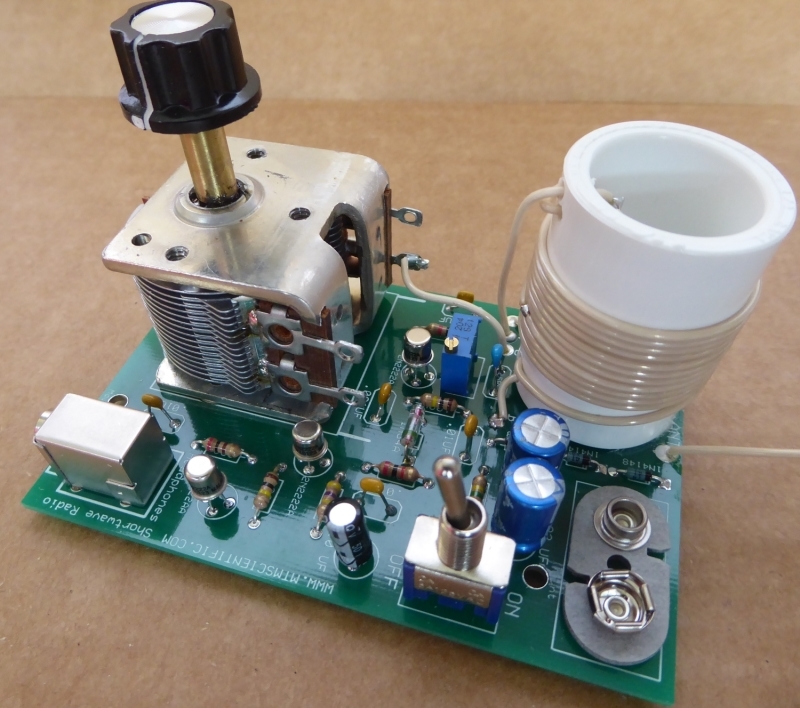 This kit will allow you to build a shortwave radio for listening to worldwide broadcasts. In addition to this kit, you will also need a simple wire antenna, a pair of common headphones and a 9 Volt transistor radio battery. Please note that this kit requires electronic assembly and soldering. Also, tuning and controlling the regenerative feedback requires operator skill and technique. This kit is for advanced electronic hobbyists. Here is a link to the instructions we include with the kit: Shortwave Radio Kit Instructions. Our Shortwave Radio Kit price is $87.50 which includes free shipping in the USA. International customers please use the separate Paypal link, which includes an additional charge for international shipping. 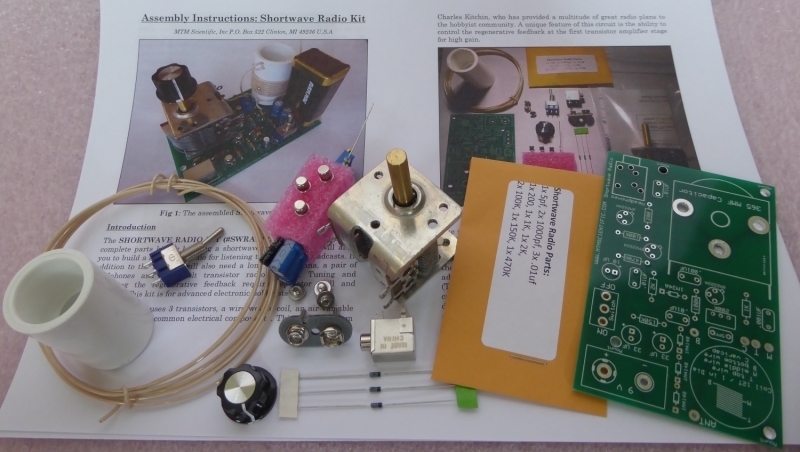 SHORTWAVE RADIO KIT (Catalog #SWRAD)... $87.50, USA shipping included! SHORTWAVE RADIO KIT INTERNATIONAL (Catalog #SWINT)... $97.50, WORLDWIDE shipping included! There are no shipping delays for Personal Checks. We ship promptly by Postal Mail. Click Here to view other kits and projects at MTM Scientific, Inc.